Today’s Guest: Bo Diddley, legendary rock and blues guitarist. “I’m the dude that Elvis Presley copied. He copied me and combined Jackie Wilson,” Diddley told me. That was a memorable day for two reasons: spending an hour with Bo in Ybor City, Florida (east of downtown Tampa), the afternoon of his show, of course, but also my memories of the photographer I worked with that day, Tom Howland, who was a long-time friend and who passed away suddenly a few years ago. Hours before the public would swarm in, Bo Diddley sat tapping out simple melodies at an ages-old piano, ample belly hanging over his belt, black felt hat perched comfortably on his head. Later, as an interview began in his dressing room, he was tapping out the 30-year-old “Bo Beat” on the side of a wooden desk. 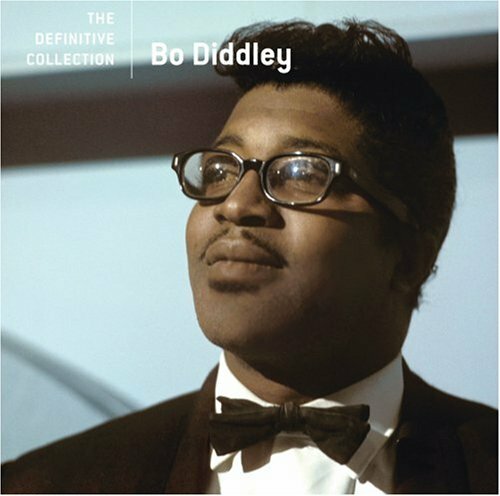 Order ‘The Definitive Collection: Bo Diddley,’ available from Amazon.com by clicking on the CD cover above! Diddley may be the man who created the dominant sound of rock ‘n’ roll – with songs like “Hey, Bo Diddley,” “Say Man,” “Mona,” “Road Runner” and a cover of Willie Dixon’s “Who Do You Love” – but he has been slighted by revisionist historians, record company accountants and lawyers. Life has never been simple for Ellas “Bo Diddley” McDaniel, born on Dec. 30, 1928 in Magnolia, Mississippi, presently a resident of Hawthorne, Florida (southeast of Gainesville). Even his born-again friend Little Richard has taken a pound of flesh, claiming he created rock. “You have to understand Richard,” Diddley sighs. 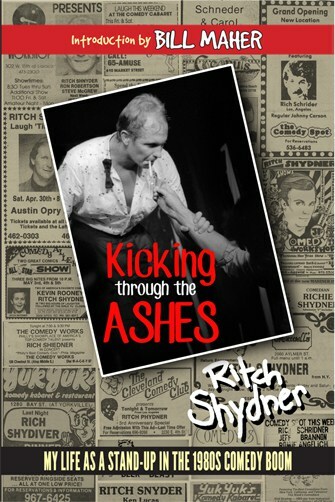 “Richard was a man that could get away with anything that had to do with music and talking. But try this on for size: I was number one. 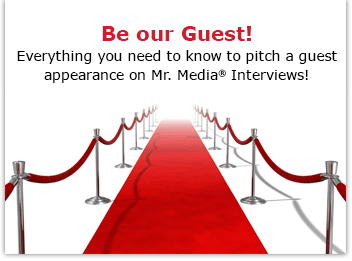 No fantasies, not trying to hog up publicity. (With “Bo Diddley” and “I’m a Man” in 1955.) I’m the dude that turned the stuff around. Later, Richard came up – ‘Long Tall Sally’, I believe it was that hit the charts. Shoot, I was already going. Richard opened the door for a lot of piano players like Jerry Lee Lewis, y’understand? He laid the groundwork. He’s a kingpin. The man is a hellified entertainer. But he’s not responsible for rock ‘n’ roll. “I’m the dude that Elvis Presley copied. He copied me and combined Jackie Wilson,” Diddley insists. Assuring his place in history is the least of the guitar-slinger’s on-going hassle~3, though. Two decades after the fact, he still works up quite a lather about being cheated out of record royalties for almost all his songs and recordings. Diddley says the record company executives at Chess warned him to keep an eye on booking agents, not themselves. He realized something was wrong when they bragged of his great sales. 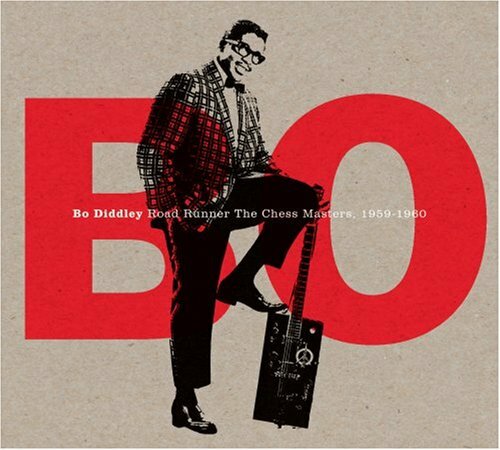 Order ‘Bo Diddley, Road Runner: The Chess Masters 1959-1960,’ available from Amazon.com by clicking on the CD cover above! The situation further frustrates the man when he looks more at today’s young artists. Diddley is also having a problem over the manufacture of his trademarked guitars. A New York company is selling an illegal “Bad Bo” square body axe, he alleges, although only Gretsch and Tom Holmes in Nashville have Diddley’s permission to use his name and design. A more personal complication in Diddley’s life is his five-month separation from his wife of more than 20 years, Kay. “She don’t even want to talk to me. It’s a bad situation,” he laments. “It’s something that bugs me. I didn’t think I could cry. It really got funky. I thought I was the hardest dude in the world. Shoot. Me, cry? Hell no.” But he did. 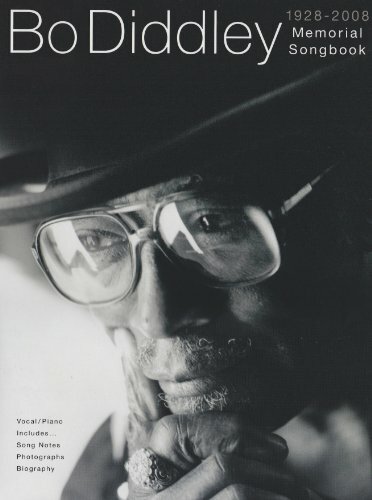 Order ‘Bo Diddley: Memorial Songbook 1928-2008 (Voice/Piano),’ available from Amazon.com by clicking on the book cover above! It was Kay who talked Bo into moving to Florida from New Mexico in 1979. With money she inherited from her parents and he earned outside the record industry, they bought a 72.6 acre farm in Hawthorne where Bo raised crops, restored crops and built a recording studio. Now the walls have come tumbling down. Until things reach a conclusion with his marriage, Diddley will not be recording any new material, although he says the first authorized live collection of his songs is being released in Paris. “I’m not going to do anything until after I get through with this divorce mess. Then I’m going to try and make some money. Ain’t no guarantee I’m going to make a dime, but I gotta try.